VoIP can deliver the benefits of a PBX phone system at a fraction of the price. Whether your Rocky Mount, NC organization is a business, a school, a nonprofit or a government agency, it can quickly benefit from the savings and tremendous functionality of VoIP phone service from Carolina Digital. VoIP for small- to medium-size businesses comes standard with many enterprise-quality features. With VoIP, your employees can work remotely while staying connected because of the ability to check messages on your smartphone and receive voicemail messages via email — among many other advanced functions. Best of all, no special equipment is needed except for Polycom or Yealink phones. School districts often put off upgrading their legacy phone systems because of fears about the cost. But with VoIP phone service for schools and other public-sector organizations, you can have an advanced cloud-based VoIP system that even allows you to connect a phone to every classroom. Other education VoIP benefits include system-wide paging, multisite compatibility, virtual fax to email, and many more. Whether you need to upgrade the phone system for a business or a school, Carolina Digital is the Rocky Mount VoIP provider that delivers amazing functionality and scalability with low overhead. Contact us today for a free quote. 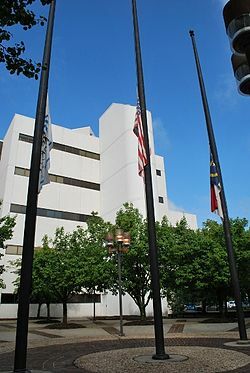 The city of Rocky Mount NC is served by the Nash-Rocky Mount Public School System, along with a number of private and charter schools in the area. North Carolina Wesleyan College is the only four-year institution of higher education in Rocky Mount. Montreat College School of Professional and Adult Studies has established convenient location in Rocky Mount. The two community colleges serving Rocky Mount are Nash Community College and Edgecombe Community College. The Rocky Mount area is filled with business owners that can quickly find the benefits of Carolina Digital’s hosted cloud-based telephone service and save up to 60% over traditional telephone services using your existing internet connection and a digital IP telephone handset. More advanced users will have access to downloading from the Apple store or Android phone a softphone app to make, receive calls, check voice mail just as if you are sitting at your desk. Experience greater functionality with lower overhead when you choose Carolina Digital as your Rocky Mount VoIP provider. Contact us for a free quote today. Call (252) 428-0300 and press option 1. In Rocky Mount NC our service delivers caller ID, call waiting, unlimited calling, follow-me, special call routing, call queues, contract-free plans, and much more. Hosted PBX is an affordable answer. Businesses Realize VOIP Cost Savings by making the switch to a VOIP Hosted PBX solution. Our rates for Wilmington, NC a are the lowest available. Put your business telephone in the cloud. What are you waiting for? Call us. (252) 377-8000.